After becoming fed up with Unity's 2d functionality when it comes to isometric games, I did a quick test to see how a combination of a 3d world with sprites would look. 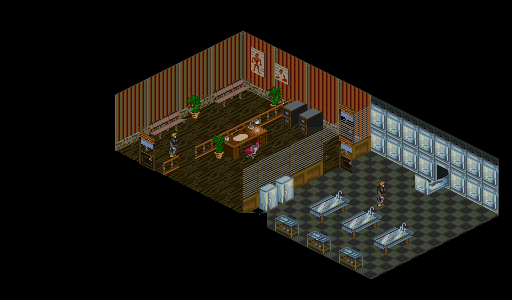 I came back to my old favourite Shadowrun on the SNES, which i funny because in a way I finally came full circle; Shadowrun was the first time long ago that I got my feet wet in game development (in 3D Game Studio, no less). 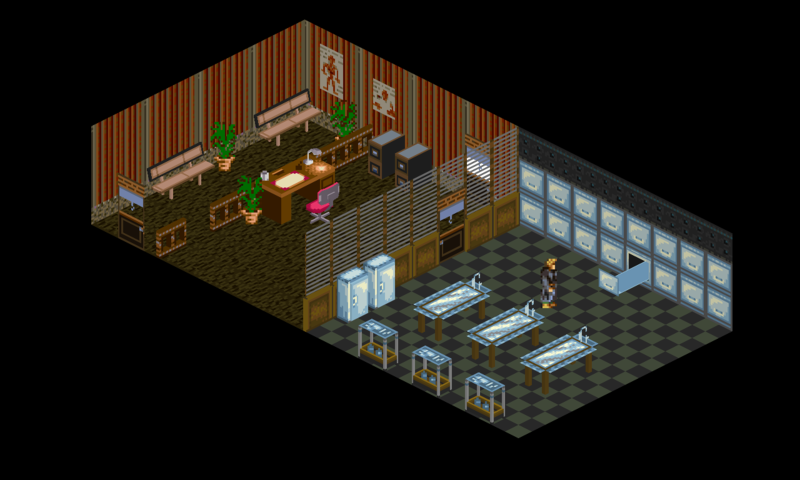 Anyway, I recreated the complete morgue scene, and everything is a textured 3D model except for Jake, the plants, the glass and the inkpot on the table. Very nice! I love the use of pixel art in this fashion. There's a lot of room for pixel characters in 3D environments, and I'd love to see more of it. Personally I've been going back and forth on whether or not I want to use pixel characters in my pixel-art styled voxel environment. Been leaning towards voxels though for some nice skeletal animation Have you tested out the interactions with objects in the scene? Or is your plan to make all "holdable" objects use pixel art? While I initially planned to keep using sprites for misc things, I now have recreated everything (save for the characters) in 3D, including tiny stuff like the ink pot on the desk. It avoids IP infringement and is more compativle with the 3D world, allowing for camera angles etc. I'm 90% done recreating the world from the first act of the game (up to Jake's exile in the Car Yard), and that is done, I will try to create some low poly characters (more low poly than the ones from Shadowrun Returns) based on the SNES sprites. So, keep tuned, the coming weeks will hopefully see some renders or even a playable demo (I've been programming in Unity for a few years now).